This ESL classroom game for kids is so simple it's genius! All you’ll need is cheap a pack of paper cups, a green marker and a red marker (although any two different colours will work just as well), and some questions. For this English game, you'll need 20 plastic or paper cups. Make a large space in your classroom and place the cups on the floor in a 4 x 5 grid. Colour the rims of all 20 cups green and colour the bottom of the same 20 cups red. Put 10 cups facing upwards showing green and another 10 cups facing downwards showing red. You’ll now have 10 ‘green’ cups and and 10 ‘red’ cups. 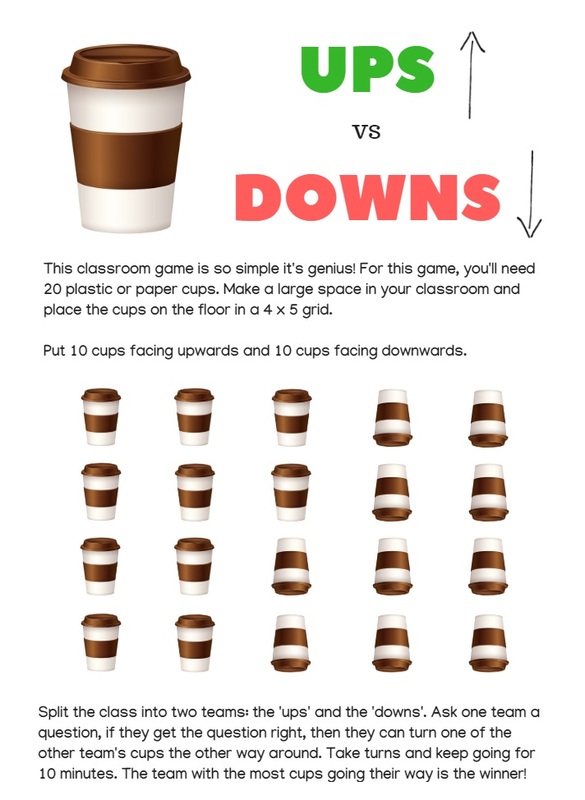 Ups vs Downs is one of the many games in our TEFL Lemon BIG Book of Classroom Games and Warmers for Kids. Split the class into two teams: the 'ups' and the 'downs'. Ask one team a question, either from their English text book, using realia, ESL flashcards, asking students to say a sentence using the target structure, etc. If they get the question right, then they can turn one of the opposition team's cups the other way around. Take turns and keep going for 10 minutes. The team with the most cups going their way and their own team’s colour is the winner! A simple ESL game for kids and visual way of scoring, which will go down well with any young learner class. You could also probably play this ESL game with teens, too. A nice high-energy ESL game for kids, but not too crazy, as you can control the kids’ movements. You’ll be reviewing vocabulary from previous lessons in this very cool and easy to set up ESL game for kids. All you need is space and a balloon. Clear a big area in your English classroom and divide your ESL students into two teams.